What else would you expect from Beauty and the Beast? More MUSIC! While the animation was top notch, the 1991 version of Beauty and the Beast was known mostly for its beautiful music. The flowing melody of the film won numerous awards including a Grammy, Golden Globe, and Academy Award for Best Original Score. And the songs were much beloved, too. Who could forget the ballroom scene with vocals by Angela Lansbury? The title song received the same accolades. So what would you expect from the live action version other than MUSIC! The live action film is proving to be an even bigger success at the box office than it’s animated predecessor, ranking #1 in 2017, #8 all time domestically, and #10 all time worldwide beating out even expected juggernauts like Guardians of the Galaxy. And it’s still playing in theaters. But if you want to own this instant classic for yourself, you won’t have long to wait. Beauty and the Beast (2017) is being released on Digital HD, Blu-Ray, and DVD on June 6. As you might hope for from a film known for its song and score, the bonus features revolve around the music of the film. There is the obligatory “how did they do it?” behind-the-scenes feature (titled “A Beauty of a Tale” which was good and entertaining). There are also deleted scenes and although a good number of them, most are simply extended battle scenes from the storming of the castle. The last one with Le Fou and Monsieur Toilette is hilarious. And there’s a nice piece about “The Women Behind Beauty and the Beast.” It seems appropriate considering the strong, independent Belle and the ways she bucks convention to forge her own path to feature the strong, independent women who shared their talent to help make this film. But the real treat are the music features! Not only can you play the movie itself with extended overture (like a theatrical production) but you can play it in sing-a-long mode with words printed on the screen during the songs so you can join in (if you don’t know the words already). Of course they have the obligatory music video with Ariana Grande and John Legend, but they also have a “making of” the music video feature. They have a feature called “Disney Song Selection” which automatically jumps to the segment in the film with your favorite song including words. A special interview with Celine Dion about her contributions to both films is a bonus as well. And there is a segment called “From Song to Screen: Making the Musical Sequences” highlighting the four most well-known numbers and what went into making them. My two favorite features though are “Enchanted Table Read” and “Extended Song: ‘Days in the Sun. '” Usually a table read is simply a run through of the script so everyone can get used to each other and get an idea of what’s happening all throughout the film instead of the segments each actor is in. But Bill Condon had a very special table read where the actors and dancers performed many of the songs and even a rough run-through of the dance routines! The extended version of “Days in the Sun” was intriguing. Not only do you get more of the music and more of the song, but there is also a slightly different way they shot it due to complications that came up in filming. It was a joy to see the extended version of this beautiful song. Surprisingly there isn’t a commentary track for the film. They do cover quite a bit in the “making of” sequence but it was a little surprising considering how comprehensive this home release is. Maybe they are saving that for a future release! It would also have been awesome to hear more from Alan Menken about the making of this film and the creation of the new songs for the movie, but with so many other features, you probably won’t miss it at all. If you’re a fan of the live action Beauty and the Beast already this will only increase your love of the film. 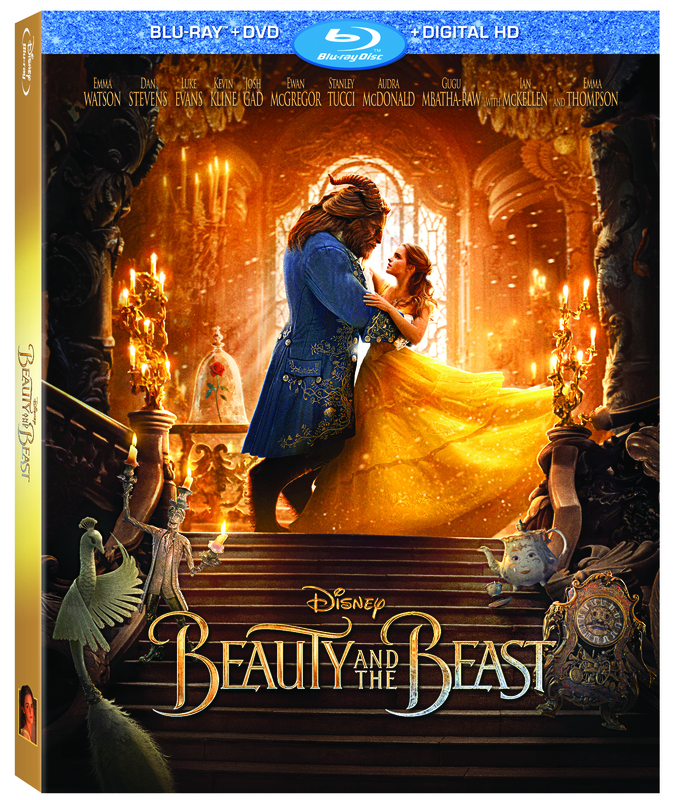 Be sure to pre-order your copy of Beauty and the Beast from your local retailer or digitally from Amazon.com and other providers. Curious about the new original story Lost In A Book? Also be sure to read our exclusive interview with author Jennifer Donnelly!